"The Leafs make me barf!" That was the rather graphic message delivered in a tiny, cute voice from the back seat of our family sedan on the way to hockey practice last winter. My 8-year-old son, the goalie on his Novice team, and his little buddy, the squad's ace defenceman, were discussing the state of the Toronto Maple Leafs and, clearly, the pint-sized blueliner wasn't impressed. Truth be told, it has been a sickly last decade or so for the Buds, with just one, measly playoff appearance in the last 11 years – and that occurred in a season cut short by one of those dastardly NHL lockouts. With that kind of pathetic production, it's easy to see why young hockey players based in Toronto failed to buy into "The Passion that Unites Us All" – one of the Leafs unfortunate marketing catchphrases. Speaking of unfortunate, I was right in the middle of a lot of the Maple Leafs mess over the last few years. As a television host for TSN and Sportsnet and a sports reporter for Newstalk 1010 Radio, I often had a front row seat for the blue and white circus. The ringmaster for much of the show? The Leafs veteran captain, Dion Phaneuf. 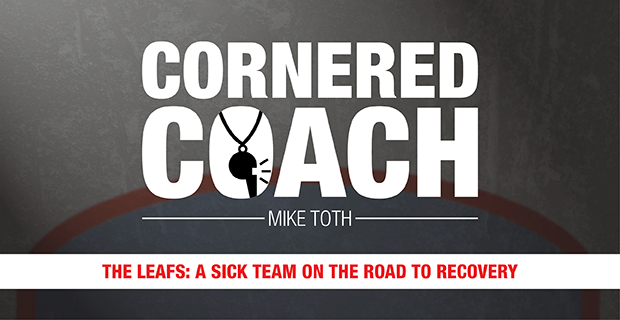 Two years ago, the Leafs basically quit on their coach, the ill-fated Peter Horacek, as they put the finishing touches on another pathetic season. But even worse, the Leafs quit on their fans – the people who have paid big bucks over the years to watch a lot of terrible hockey. Upset with being booed by ticket holders, the Leafs came up with the bright idea of doing away with the customary post-game stick salute to the Air Canada Centre crowd following one of their extremely rare victories. Phaneuf, of course, was one of the great minds behind the "stick it to the fans" plan and, holding my Newstalk 1010 microphone, I asked him about it following practice the day after. "Why didn't you guys salute the fans?," I questioned the captain. "We just decided to change things up a bit to help us get back on track," explained Phaneuf. "You actually think that insulting the fans is going to help you win a hockey game?,” I asked. "Well, we just wanted to try something different to change up the routine." I was obviously skeptical about Phaneuf's explanation, as it was clear to everyone that the Leafs were trying to send a message to the boo-birds of their fan base. "If you're so worried about changing your luck," I retorted, "why don't you just bite the head off a chicken and get it over with?" For the uninitiated, biting the head off of chickens, frogs, etc. was inspired by crazy college football coaches of days gone by who, according to folklore, were willing to go to any lengths to fire up the troops. Fortunately, modern-day SPCA regulations have cleaned up coach's speeches considerably. Phaneuf and the Leafs, meanwhile, weren't impressed that I was questioning their motives, and one of the team's media relations people jumped into the fray to issue a threat. "Hey, Mike!,” the company man barked. "We can take away your media pass, you know." "Go ahead and take it," I replied. "I've got news for you. I'd rather watch my little guy's team play than watch your lousy hockey club." Surprise, surprise. I don't cover the Maple Leafs on a daily basis anymore, as my days in the mainstream media have come to an end. Somehow, my interviewing methods became outdated in a more corporate world that often sees the teams owned by the very media outlets that are supposed to provide unbiased coverage. But I kind of miss hanging around the Maple Leafs. Because after years of plug ugly hockey, the Leafs finally appear to be on the right track. Sure, they're coming off a last-pace finish. But dwelling in the cellar came with a huge asterisk named Auston Matthews. Watching the big kid score four goals in his first ever NHL game was as thrilling as it gets in hockey and with other young talent such as Mitch Marner, William Nylander and Morgan Reilly also in the fold, the Leafs seem to be guaranteed a bright future. To be honest, I'd still rather watch my little guy's team play. But it's fun following Toronto's NHL team again and when the kids discuss the Leafs in the back seat of the car on the way to hockey practice, it's nice to report that, these days, it's a no-puking zone.